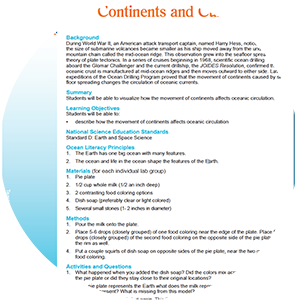 Actvity Summary: Students will be able to visualize how the movement of continents affects oceanic circulation. During World War II, an American attack transport captain, named Harry Hess, noticed that the size of submarine volcanoes became smaller as his ship moved away from the underwater mountain chain called the mid-ocean ridge. This observation grew into the seafloor spreading theory of plate tectonics. In a series of cruises beginning in 1968, scientific ocean drilling aboard the Glomar Challenger and the current drillship, the JOIDES Resolution, confirmed that oceanic crust is manufactured at mid-ocean ridges and then moves outward to either side. Later expeditions of the Ocean Drilling Program proved that the movement of continents caused by sea floor spreading changes the circulation of oceanic currents.